I have recently bought a book about flavour – it’s like a bible for what goes together, and straight away I picked up on chocolate and cardamon as I really like the taste of cardamon in a dessert. I’d say this one is an aquired taste though so if you don’t like dark bitter choolate I wouldn’t bother, it is a very rich tart! 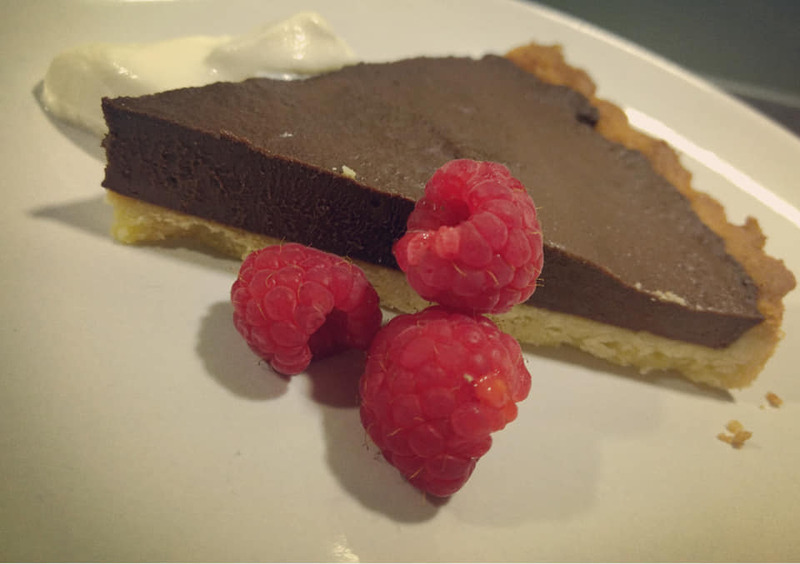 I served this with creme fraiche and fresh raspberries rather than cream as I thought that might be too rich but if you have a sweet tooth go ahead and stick some whipped cream on! This would be really easy to make if you bought ready roll sweet pastry but I will put the recipe just in case you want to go the whole hog like I did. 1 hour to prepare and 2 hours to set. Start by preparing a 20cm sweet pastry case. Put the butter and flour into a bowl and rub together until it resembles crumbs, add the sugar and the egg and mix together with your hands until it resembles a big ball of dough. If it needs more liquid add a splash of milk. Chill the pastry for at least 30 minutes and then roll out until it fits into your tart case. I use one with a push up bottom so I dont have to worry about greasing the sides. trim the edges of the pastry and then bake in the oven for 10 – 15 minutes until the case is cooked then remove and let cool. Bash the cardamon pods in a pestle and mortar and remove the skins then grind up the seeds to form a powder. Put the cream and chocolate in a sauce pan and warm up enough to melt the choclate pieces then add the cardamon powder, mix together vigourously then set aside to cool. When the case and chocolate filling have cooled, fill the tart case with the chocolate mixture and put in the fridge for at least 2 hours until it is solid. Remove from the fridge 30 minutes before eating and serve with a dollop of creme fraiche and some fresh raspberries.